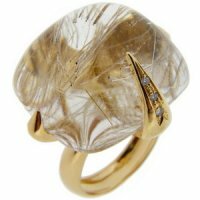 Cushion Cut Rutilated Quartz and Diamond Ring. A Contemporary Rutilated Quartz pendant. 18ct Yellow Gold. A Majestic contemporary Rutilated Quartz and Diamond Pendant.